A few weeks ago, one of CB’s old university pals invited us over for dinner. Over a delicious pasta dish, both of them start reminiscing about the kinds of food that they ate at university and CB suddenly recalls the delicious chicken and ricotta lasagne that her friend used to make. “Oh that?” says her friend. “That was from a recipe card from Waitrose”. CB was in disbelief. At this point, we both knew we were going to try it. Thanks Lauren! Use fresh pesto from the chilled cabinet where possible – the flavour is a lot more intense and will go a long way in the ricotta mix. Use as strong a cheddar as you dare. My personal favourite is that seriously strong cheddar that is so strong, it makes your face feel like it’s going to fall in on itself. Preheat your oven to 20 degrees. Gently fry the onion, bay leaves and garlic in about a tablespoon of oil until soft – about 10 minutes. Add the chopped tomatoes, season well and simmer on low for 30 minutes. While the tomato sauce is cooking, make the ricotta mix. 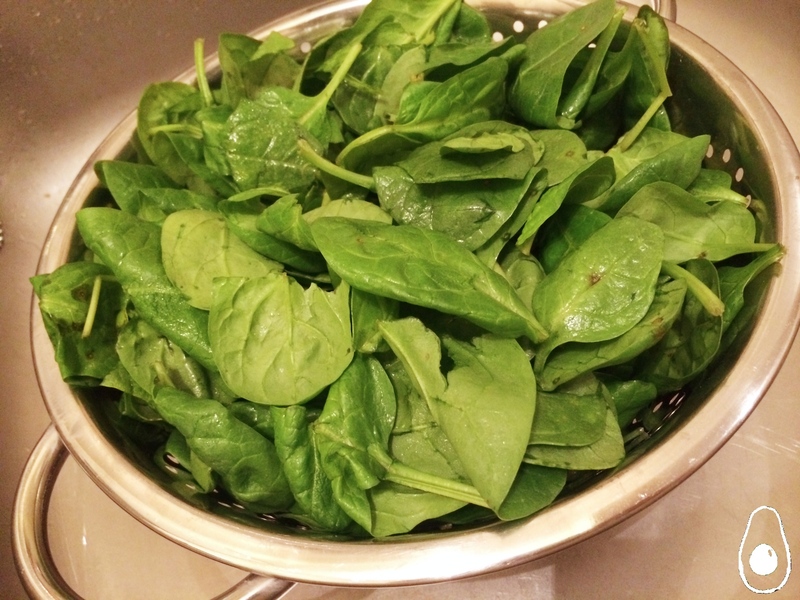 Put the spinach in a colander and pour a kettle full of boiled water over it until wilted. Take a spatula and press as much of the water out as possible. Chop roughly. Combine the pesto, nutmeg, ricotta and spinach in a large bowl. Season well. Season the chicken breasts and cook using your favourite method. We used our George Foreman grill but you can pan fry or bake if you prefer. Once cooked, shred. Layer the lasagne: start with the chicken, cover with a layer of the ricotta mix, then lasagne sheets, then the tomato sauce. Top this with half of the mozzarella. Repeat this layering process, adding the cheddar to the final layer. Put the lasagne in the oven and bake for 45 minutes, or until golden brown. Serve with a simple salad made from avocado, rocket and diced tomato, drizzled with balsamic vinegar. This dish looks so delicious. A perfect comfort meal for these cold evenings. 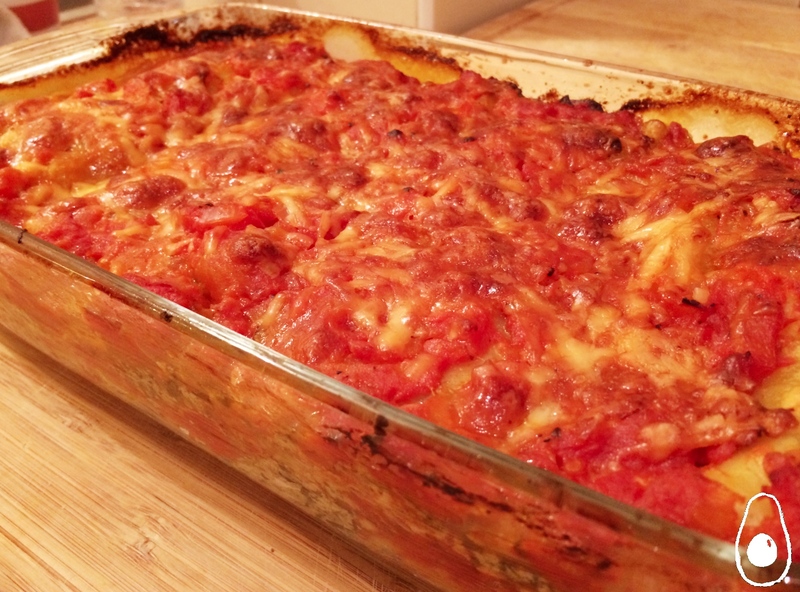 I’ve never had chicken lasagne… thanks for this original recipe! FF people will love it!